Along a twelve hundred meter stretch of Amsterdam’s southern ring road, a business park is being developed, Zuidas (South Axis), the Netherlands’ new prime business location. Billboards of building companies with promising presentations of what the near future has on offer stand amongst the ghostly lit cement skeletons of newly constructed office towers. For almost fifteen years now, the area to the west of Amsterdam’s ring road has been subject to large-scale redevelopment, in what is considered to be Europe’s biggest urban renewal program. The district called the Westelijke Tuinsteden (Western Garden Cities) has been built on the basis of the modernist General Expansion Plan of Cornelis van Eesteren. Presented as an advanced, modern living environment for the new Man, the area’s reputation has long been in decline. It’s image changed into that of a backward neighborhood, a ‘concentration area’ marked by segregation and social issues. The architecture has generally been seen as intrinsic to these problems, leading to the present large-scale demolition. Though officially the renewal program is supposed to protect the Garden City qualities of the area, in reality the restructuring lacks any coherent vision of what that would mean. Ironically, some of the same mistakes of the modernists planners are now being repeated, most notably the fixation on form in stead of the social use of space. This essay traces the origins of the ideas behind the planning of the Western Garden Cities, to see whether some of these can be salvaged and put to use again in the 21st century. 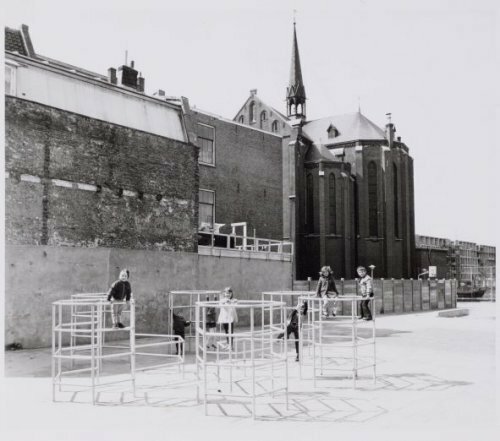 In 1947, the architect Aldo van Eyck built his first playground in Amsterdam, on the Bertelmanplein. Many hundreds more followed, in a spatial experiment that has (positively) marked the childhood of an entire generation. Though largely disappeared, defunct and forgotten today, these playgrounds represent one of the most emblematic of architectural interventions in a pivotal time: the shift from the top down organization of space by modernist functionalist architects, towards a bottom-up architecture that literally aimed to give space to the imagination. The long version of an interview I did with Franco Berardi, for the art mag Metropolis M, winter 2011. Franco Berardi, better known as “Bifo”, is an Italian autonomist philosopher and media activist. One of the founders of the notorious Radio Alice, a pirate radio station that became the voice of the autonomous youth movement of Bologna in the late 1970s, Bifo is the author of multiple works of political theory, including The Soul at Work and the recently published After the Future. MO: How do you look at the present crisis from the perspective that you have developed in your work, which revolves around the interconnectedness of economy, language and psychology? Do you remember what happened at the end of the nineties and especially in the spring of the year 2000? After a decade of development, of growth and also of hope; after the belief in the possibility of infinite expansion of a virtual capitalism based on new technologies, there was a collapse. The bursting of the Internet bubble. It was a very important moment. And in a sense, what happened in September 2008 in the United States and what is happening now in Europe, can be considered as the long aftermath of the crisis of 2000. Because in that crisis, all the elements of novelty, of the new forms of capitalism which I like to call semiocapitalism, manifested themselves openly. “No one is safe.” With these words Halbe Zijlstra, the State Secretary of Education, Culture and Science, announced the slashing of the cultural budget on the Dutch national news in December 2010. Whereas cutbacks are generally accompanied by at least the pretension of reluctance or regret, Zijlstra delivered the message with a sardonic smile. It’s a rather uncommon spectacle: a State Secretary of Culture who publicly flaunts his disdain for culture. Zijlstra described artists as being on a “subsidy drip” and took care to present himself as an avowed fan of Dan Brown, Tom Clancy, McDonalds and Metallica. Known amongst artists as “Halbe the Wrecker,” he has become the embodiment of the anti-artistic and anti-intellectual sentiment in the Netherlands. Zijlstra became the figure of the philistine that the cultured classes love to hate. And he welcomes that hatred.